We currently have affiliate relationships,where we receive commensurate payments from a number of manufacturers,either directly or through third parties like Amazon. Some of the brands include NordicTrack, ProForm, Reebok, Epic Fitness, Smooth Fitness, Sole Fitness, BowFlex, LifeSpan, LifeCore, Horizon Fitness, LiveStrong, Precor Fitness, Fuel Fitness, Schwinn, Stamina, Eclipse, Spirit Fitness, Merit Fitness, DiamondBack, AFT, Gold’s Gym,Yowza, FreeMotion, LifeFitness, Weider, Healthrider, Weslo and Image. With the above brands and with other brands where we have no affiliate relationship, we attempt to be objective in our ratings. For example, brands like Weslo and Image, which we feel are subpar, we do not endorse. Our goal is to match the appropriate exercise equipment to a user’s fitness goals. When appropriate, we will suggest alternative products that are a better value. When models are on sale and/or discounted we try to bring that to the customer’s attention. 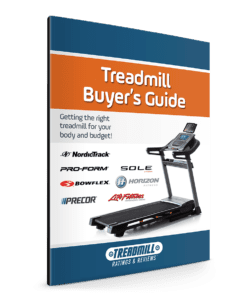 This arrangement makes it possible for us to offer some of the most detailed information about treadmills found on the Internet. It also offsets the costs of maintaining this website. If you have any questions you can reach us at [email protected]. At www.Treadmill-Ratings-Reviews.com we do our best to provide precise and accurate information. Our recommendations are based on either actual use of the treadmill or various third-party and customer reviews. Before purchasing a treadmill we encourage the buyer to do their own due diligence by either actually testing the treadmill, or researching further information. We also recommended that the buyer understand that not all manufacturers provide the same quality of customer service. Once again, researching online or off can give you insight into the company’s reputation. You can check BizRate, Epinions, Amazon and other shopping comparison sites for customer reviews. You can also check sites like shopping.com for ratings and reviews on dealers and sellers. We also encourage you to read our Buyer’s Guide and our other articles. They will give you insight not only treadmill mechanics, but also on buying techniques. We attempt to be as accurate as possible regarding prices, features, special offers and warranties. Unfortunately manufacturers constantly change all of the aforementioned. Before you buy check with the retailer or manufacturer for the latest information regarding each model. It should be noted that we have affiliate relations with certain manufacturers, and we allow several treadmill dealers to advertise on this web site. This allows us to continue to provide indepth reviews for the benefit of our readers. www.Treadmill-Ratings-Reviews.com is wholly owned by InterMax, Inc. IN NO EVENT WILL InterMax Inc. BE LIABLE FOR (I) ANY INCIDENTAL, CONSEQUENTIAL, OR INDIRECT DAMAGES (INCLUDING, BUT NOT LIMITED TO, DAMAGES FOR LOSS OF PROFITS, BUSINESS INTERRUPTION, LOSS OF PROGRAMS OR INFORMATION, AND THE LIKE) ARISING OUT OF THE USE OF OR INABILITY TO USE THE SERVICE, OR ANY INFORMATION, OR TRANSACTIONS PROVIDED ON THE SERVICE, OR DOWNLOADED FROM THE SERVICE, OR ANY DELAY OF SUCH INFORMATION OR SERVICE. EVEN IF InterMax Inc. OR ITS AUTHORIZED REPRESENTATIVES HAVE BEEN ADVISED OF THE POSSIBILITY OF SUCH DAMAGES, OR (II) ANY CLAIM ATTRIBUTABLE TO ERRORS, OMISSIONS, OR OTHER INACCURACIES IN THE SERVICE AND/OR MATERIALS OR INFORMATION DOWNLOADED THROUGH THE SERVICE. BECAUSE SOME STATES DO NOT ALLOW THE EXCLUSION OR LIMITATION OF LIABILITY FOR CONSEQUENTIAL OR INCIDENTAL DAMAGES, THE ABOVE LIMITATION MAY NOT APPLY TO YOU. IN SUCH STATES, InterMax Inc. LIABILITY IS LIMITED TO THE GREATEST EXTENT PERMITTED BY LAW .InterMax Inc. makes no representations whatsoever about any other web site which you may access through this one or which may link to this Site. When you access a non-App Crafters, Inc. web site, please understand that it is independent from App Crafters, Inc., and that InterMax Inc. has no control over the content on that web site. In addition, a link to a App Crafters, Inc. web site does not mean that App Crafters, Inc. endorses or accepts any responsibility for the content, or the use, of such web site. You agree to indemnify, defend and hold harmless Intermax inc, its officers, directors, employees, agents, licensors, suppliers and any third party information providers to the Service from and against all losses, expenses, damages and costs, including reasonable attorneys’ fees, resulting from any violation of this Agreement (including negligent or wrongful conduct) by you or any other person accessing the Service. We do not give or sell personal information to any third parties? Any information we collect during the course of business is maintained in the strictest confidentiality. Though we may from time to time send you information related to health and fitness, we will never give or sell your personal information to parties outside of Treadmill-ratings-reviews.com. This includes email addresses. Your privacy is extremely important to us.